Are you frequently holding your phone while you watch or record your videos? The Skomet phone stand is exactly what you have been looking for! An amazing accessory to your device. - Follow the recipes in your kitchen without worrying about spills damaging your device. 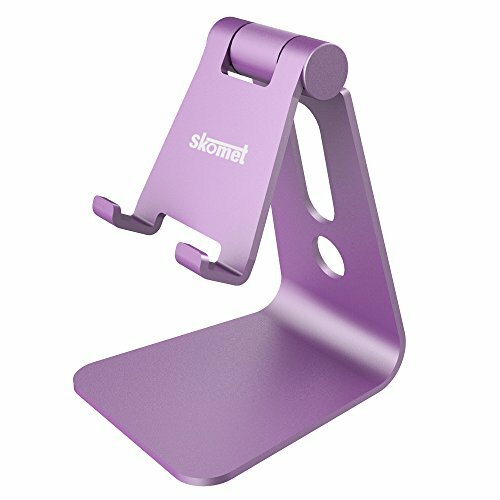 Do not waste time looking at cheaper phone stands and buy a quality product to make your purchase worthwhile. Compatible with Apple and Android devices. A perfect addition to your phone accessories. Buy now with complete confidence. ★ ADJUSTABLE MULTI ANGLE: Features a 270 degree adjustable angle ideal for recording or watching videos and reading at a comfortable angle. The adjustable stand is smooth but firm so your phone will stay at the angle you choose. ★ ANTI SLIP SILICONE: Added protection for your smartphone with the help of an anti slip silicone padding. ★ UNIVERSAL STAND: Compatible with most smartphones. Works with Apple iPhone 7, iPhone 6s, iPhone 6s plus, iPad, Samsung Galaxy S5 S6 S7, Sony, LG etc. ★ DURABLE: Quality craftsmanship with a sturdy aluminum body that will last a lifetime. If you have any questions about this product by Skomet, contact us by completing and submitting the form below. If you are looking for a specif part number, please include it with your message.